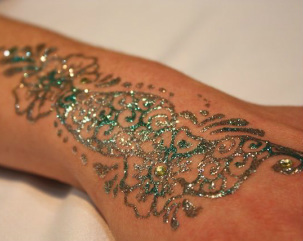 Specializing in custom Henna and Shimmer temporary body art inspired by traditional and modern designs. Available for corporate and private events, individual appointments, weddings, bachelorette parties, birthdays, bat mitzvahs, baby showers, festivals, lessons, and photo shoots. Serving the Granite Bay and Surrounding areas with over 20 years of experience. Travel radius applies. May be negotiable. Never hurts to ask. Please note: I work a 'regular' full time job. I'm often not able to answer my phone, but I return all messages. Text messages get a much faster response. Same day appointments are sometimes available. Just shoot me a message! Enjoy a natural and beautiful temporary body art that has been practiced for thousands of years. 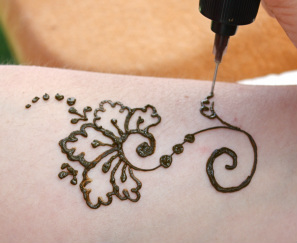 Henna leaves a red-brown stain that lasts 10-15 days, henna is a great way to celebrate, no matter the occasion. All natural and safe for everyone ages 3 and up. Shimmer tattoos create a sparkling, waterproof body adornment that lasts 3-7 days. Custom designs mean your body art is always unique. Using only medical and cosmetic grade materials ensures that it's safe for all. 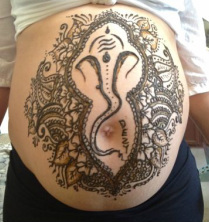 Celebrate this wonderful time with a henna belly blessing. Sit back and enjoy the relaxing experience of having a custom henna design created just for you. Henna adds a unique touch to prenatal photography. Designs last 7-10 days. Always safe and natural. Custom henna's candles as favors.